Lord Sri Krsna, the Supreme Personality of Godhead, stands on the bank of the River Yamuna with Srimati Radharani, His eternal consort, in this scene in Goloka Vrndavana, the Lord’s spiritual abode. 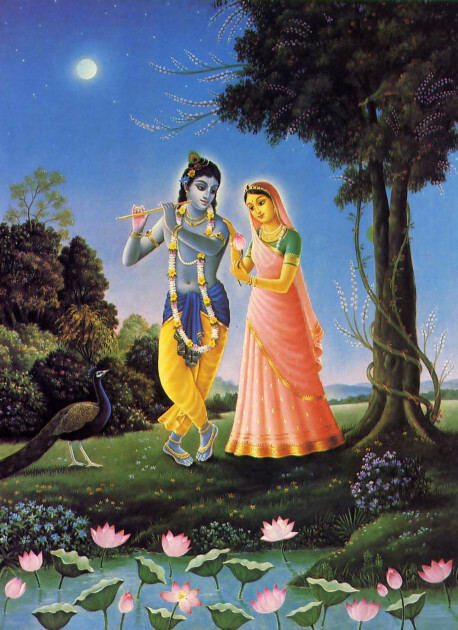 The prancing peacock’s jubilant calls, the fragrance of the lotus and jasmine spreading on the cool, soughing breezes, the fresh springtime atmosphere-all lend the perfect touch to this most exalted spiritual event: the meeting of Radha and Krsna. 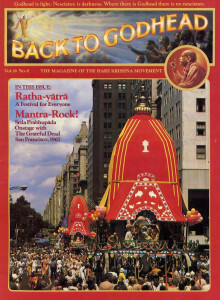 Our original nature is to dwell in the “bright sun” of love of Krsna in the spiritual world. But somehow we become envious of Krsna in His position as supreme enjoyer, and with that envy our love for Him turns to lust and we enter the darkness of the material world. Thus it is lust that brings us to this world of forgetfulness of God, lust that keeps us here, and lust that prevents us from knowing Lord Krsna as our eternal master, guide, friend, and lover. Only when we transmute that lust back into love for Krsna can we realize that we are His eternal servants and that our real happiness lies in serving His senses, not our own. So let us not be misguided. Krsna is God, the all-powerful, all-perfect creator, maintainer, and destroyer of everything, and Srimati Radharani is His most beloved worshiper (Her very name means “one who worships Krsna best”). Since we are all servants of the Lord, each of us has some role to play in His eternal pastimes of love. But we can discover that role, our original spiritual identity, only if we carefully follow the instructions of those exalted souls who have realized God and whose only motivation is compassion for those of us suffering in this material world, far from our spiritual home. If we follow their instructions, we will one day realize the truth of the unlimitedly sweet pastimes of the Lord-and this will be the perfection of our lives.